I was born March 16, 19131 on a farm six or seven miles from Anthony, New Mexico. Anthony is 20 miles north of El Paso, Texas. The state line of New Mexico and Texas runs right through the center of Anthony.2 The day I was born my father planted a tree in our front yard. I don’t know if the tree ever grew because we didn’t stay there long enough to find out. The day I was born a Dr. Lawson from Anthony was suppose to come to our home and deliver me. He was late and in those days they had to travel by horse and buggy. When he did arrive,I was already born. A Mexican lady who lived on the farm helped my mother with my birth. By the time the doctor arrived, I was already cleaned up. They put me in a shoe box. I weighed 3 ½ pounds at birth. One of my earliest recollections during the time I lived in Tyrone was the first time I owned a sled you could use in snow. Another thing I remember about living in Tyrone was a time I had to have a haircut. My grandmother, Lilly, gave me 50 cents and I walked into town which was about a mile away. I went into the barber shop and got my own hair cut. My dad gave me homemade haircuts for quite a few years until I was about 10 years old. He had a pair of hand clippers and I used to dread getting haircut from him because it seemed he pulled my hair quite a bit. Those old clippers were dull I guess and they use to hurt me. I dreaded those haircuts more than anything. My dad joined the army and later was honorably discharged in San Antonio, Texas.7 He served one year and was discharged because he had dependents to support. My mother and I would visit him in San Antonio while he was in the Army. I remember one day we went on a picnic. We went out in front of the Alamo. It seemed to me there was nothing around the Alamo. Today it has grown up all around. When my dad got out of the army, we went to Long Beach, California where my dad worked in the ship yards. The war was still going on. He was discharged from the army before the war was over. While we were there, my grandmother Hall came from El Paso to San Diego to visit with us. She, my mother and I went down town to a big department store. It was crowded with lots of people. When we were there, I got separated from them. All of a sudden they noticed I wasn’t around so they looked all over the store trying to find me. Finally, they cam out on the side walk and I was sitting down crossed legged with my hat in my hands. I was begging. I had seen a beggar on the street before that and people were giving him money. Both of his legs were gone but he was sitting up with his hat in his hand with pencils. They found me. I don’t remember this incident but my mother told me and I guess I was out there trying to get money like the old beggar. The first schooling I had was kindergarten in Long Beach, California. 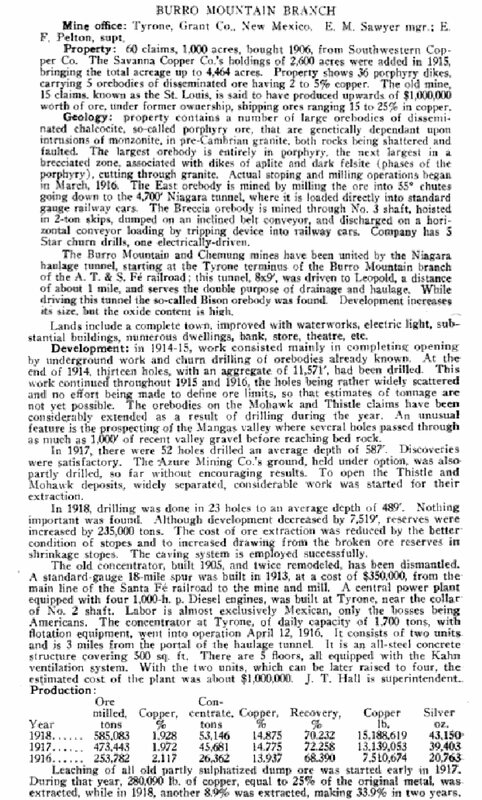 In 1918, the town and mine shut down in Tyrone, New Mexico and my grandfather retired. We all moved back to the farm in Vinton, Texas. Before this my grandfather had already built a home in the little town of Vinton. There were about five houses and one great big grocery store that served all the farmers for miles around. He also bought another place across the highway from the new home and started a dairy. Dad ran the dairy for my grandfather for a short time. They sold their milk wholesale putting it in five and ten gallon cans. They took it to El Paso and sold it to the creameries. I can remember my father coming home one day in a big old truck that he used to take the milk into town with. He delivered the milk. I remember the tires on the old truck were solid rubber. That was before they had rubber tires inflated like they have now. I remember one Christmas there, I got a little automobile I could ride in. It had electric lights. That was the greatest thing there ever was. My mother always wanted a fur coat. So my grandfather Hall told her if she would trap enough muskrat off the river, (the Rio Grande River ran fairly close to the dairy), he would pay to have the hides made into a fur coat for her. So one winter my mother spent the whole winter trapping muskrat and my grandfather had a fur coat made for her. She was really proud of that coat. I remember going to a little one room school in Vinton. I don’t remember how many grades were in the school. I remember it had a great big pot belled wood stove. That was the only way we had to keep the room war. It got pretty cold in the winter time. I was in the first or second grade. I remember an incident that happened in this little one room school. In those days when a kid had to go to the bathroom, you raised either one or two fingers. That would tell the teacher what you had to do. I raised my hand to go to the bathroom. They had an outdoor toilet. I raised my hand and the teacher ignored me so I finally wet my pants. I was real embarrassed about that. I remember inside the old school, they had a cloak room in the back where we hung our coats. I also remember going to another school in a little town called Canutillo. Canutillo was five miles from Anthony where we lived but it was in Texas. I remember an incident that happened in this school in the third or fourth grade. There was a little Mexican girl in my class. Her name was Carlotta Carazco. I’ll never forget her. She was a pretty girl. Her father owned the movie theater in Canutillo. I really liked Carlotta. She was a dumb girl and had a terrible time in school. The teacher told her she wasn’t going to pass. She was going to be kept back in the same grade the next year. I remember writing her a note. I said, “I won’t pass so I can be with you next year in the same class.” The teacher caught me writing this note so she opened it and read it to the class. I was really embarrassed about that. Another story I remember is about my dad. My dad went to Santa Barbara in Chihuahua Mexico to work in the mine. American Smelting and Refining Company He came first by himself and then mother, Bill and I came later. When my dad went down, the company sent a big limousine to Juarez to pick up my dad and several other men who were going to work there. They had a colored man who was the chauffeur. 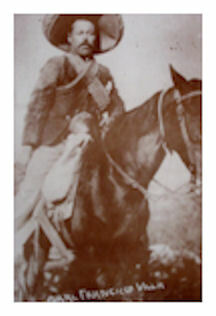 Just before they got to the town of Chihuahua, Poncho Villa was raiding the town and trying to take it over. The Federalist had the town prior to this. Poncho Villa captured the car my dad was in and all the men. My dad had just gotten out of the army and had his army hat and army shirt on so he said. Pancho Villa was going to shoot them for being spies but my dad who spoke fluent Spanish talked to Poncho Villa and told them what they were doing. Pancho Villa turned them all lose then. He saved their lives. While they were driving to Chihuahua on the outskirts of town there were dead people on both sides of the highway who had been in the battle with Poncho Villa. I remember Mother, Bill and I left El Paso to go to Santa Barbara to live where my dad was working in the mine. We were riding the train. We caught the train in Juarez and just before we got to the big town, a group of men on horses came along and stopped the train. There were about a dozen white people on the train. The women said, “Oh, Pancho Villa, Pancho Villa is going to kill us.” Well, all he wanted to do was stop the train to put a bunch of his relatives on and then let us go on. We lived in Santa Barbara for several years, I don’t remember how long. While living there, I was told I was 8 years old when I got my first job. My dad gave me a job in the mill with him. I was his office boy and got a peso a day. A peso in those days was worth 50 cents in American money. I remember going down to the pay office and getting my pay one month. They gave me thirty silver pesos and I thought I was the richest guy in the world. My mother saved my money for me. All she would give me after I got my pay was one peso to spend and the rest she saved. She saved enough for me to buy a brand new bicycle when we left Mexico to go back to the United States. I remember the first pay day that I got, a kid named Orville Schlissinger and I went down into the Mexican part of town. We went into a little store and I bought us a bottle of orange soda pop. The soda came in big bottles in those days. We were drinking the soda pop and Orville who wasn’t really mean but kind of ornery, drank almost all of his soda pop. A little Mexican kid came up and wanted to shine our shoes. Orville took the remaining soda pop in the bottle and threw it in the Mexican kid’s face. The Mexican kid drew a knife. It looked to me like it was a foot long. He chased us out of the little store. We started running home and Orville turned off the road to his house and I kept going straight to my house. All of a sudden I looked back and the Mexican kid was chasing me. Boy was I scared! Seeing I couldn’t out run him, I stopped and he cam up to me and said, “You forgot to pay for the soda pop.” In those days I talked pretty good Spanish because I only played with Orville and Mexican kids all the time. I had to go back to the store and give the owner my peso. I don’t remember how much change I got back. I went back to pay for the saida pop and then I went home. That’s one of the things I remember about Santa Barbara. Another thing I remember about living in Santa Barbara, in Mexico was the bandit named Pancho Villa. Well, Pancho Villa used to come to the mining camp we lived in twice a year. He would come there and the company would throw him a big banquet. This is the way they give him moredea. That is the Mexican name for something like a pay off. They would pay him off and he would leave the mining camp alone. He wouldn’t raid the town or bother their payroll when the money was shipped in to pay the employees. In the town of Santa Barbara, they had a big club house with a bowling alley, pool tables and a big dining room for banquets. I remember one night a banquet was given for Pancho Villa. The tables were big and long. Pancho Villa was at the head of the table. I don’t know who the other people there were. Pancho Villa had his soldiers seated from about the middle of the table going all the way around to the middle of the table on the other side. His soldiers had pistols on their hips, rifles in their hands and bandoleers that crisscrossed their chests which were full of shells. They were there to protect him. I was an eight year old kid playing all over the place with the other white kids. We thought nothing of being around Pancho Villa. While we were living in Santa Barbara, Mexico, the political scene became bad and Pancho Villa was plundering and pillaring the whole country. The mining company decided it was too dangerous for the white people there so we had to leave. We got on the train and went back to El Paso. I had the measles. I remember my mother was so scared when we got to the United States line that they would stop her and make her put me in a detention place where you had to go when there were diseases that could be spread. We finally got across the line all right. Mother said I had red spots all over my face but I had a bunch of freckles anyway so that saved me from having to go to a detention center. Everything back in that part of my life is a lot of hear say my mother told me. We lived in Santa Barbara two different times. The first time it was just me but the second time Bill, my brother, was with us. He had been born in Vinton, Texas. The last time we came out of old Mexico Bill was with us. After we got back to El Paso, it was then that we went to Vinton. My grandfather had bought the place across the highway and started a dairy. My dad ran the dairy for him. I don’t know how long we lived there. After living in Vinton, we moved to Ajo, Arizona. I went to school in Ajo for the fifth, sixth and seventh grades. My grandfather Hall died in 1925 and since my grandmother couldn’t drive a car, she talked my mother and dad into letting me come and live with her in Vinton. I went to school in Anthony in the eighth grade. I was the only kid in the valley who got to drive a car. I would drive the car to school. She had a brand new, big, Doge sedan. I drove that car to school every day. I remember an incident going to school there in the eighth grade. When I would leave the house in the morning to go to school, I would stop at the store that I told you about that served all the farmers around the valley. I would sometimes get candy and walk to school. When I would get to school the kids would take hold of me and take my candy away. One April Fool’s Day, I went down to the store that morning and got some dandy. I told Clark Rushenbuger, the man who owned the store, about these kids taking my candy. He said, “Let’s fix something up for them.” So I got about a dozen of those great big gum drops. He slit them open and poured red hot pepper into them. When I went to school, I decided I better wait just before the bell would ring because we’d all get up on the steps and give the Pledge of Allegiance and go on into our classes. I waited just before the bell rang and got out of the car and started waling over. I had the sack of candy in my hand. All of the boys started coming over and taking the candy away from me. I didn’t put up much of a fuss. About that time the bell rang. We had to get up on the steps and give the pledge of allegiance. The kids were eating that candy and had the hot mouth. They all liked to beat me to death later on. We had a lot of fun anyway. My mother had six brothers and sister. Price was the oldest, then mother, then Lottie, Dorothy, David, Fred and Bob. Fred and I were boon companions. We got along really well. Fred was two years old than I was. When he was younger, he had rheumatic fever. He was in bed for two years and couldn’t go to school. That made him and me even in school. We were in the eighth grade together and we graduated from the eighth grade at the same time. My grandmother sent me to a lady in the valley who taught dancing and she taught me how to dance. Fred learned how to dance but I don’t know who taught him. Fred was the best friend I had in my whole life. Fred was a good kid. We got along well together. Fred died in 1938. My grandmother let me drive her car anytime I wanted so we went to dances all over the valley. We’d go to the country club and have a big time. 1. 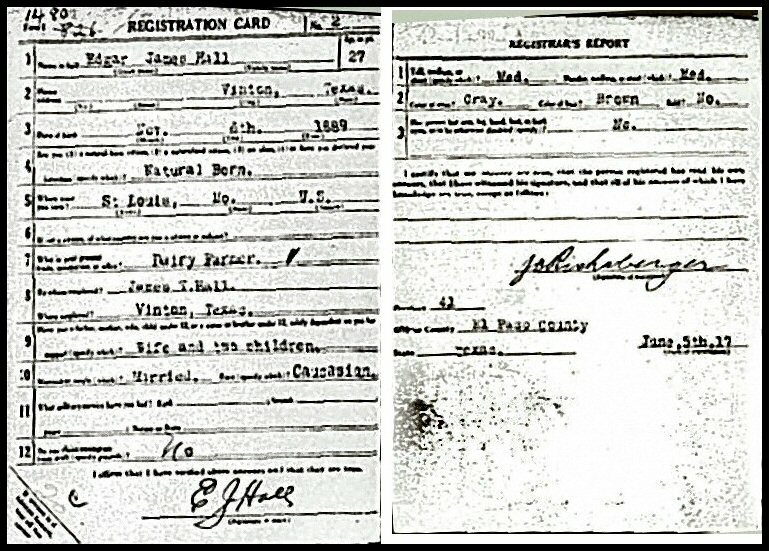 State of New Mexico Department of Public Health, Family Records: Hall, James Oscar Birth , Certificate, 24 May 1941, Janice Hartman, 3367 S. Joshua Tree Lane, Gilbert, Arizona 85297. This is a delayed birth certificate with three verifications: (1) Affiavit of Mrs. J. O. Lipps, grandmother, signed 16 December 1955, (2) Application to the New York Life Insurance Co., #16-181-706 dated at Morenci, May 24, 1956 and (3) Birth Ceriticate of daughter, Janice Marie Hall, born August 31 1941, Tucson, Arizona, filed September 5, 1941. 3. This is a picture of Morenci, Arizona (1913) around the time that James T. Hall and Edgar worked at the mine.